Read our best brush for Pomeranian guide for some helpful grooming product suggestions and additional tips. Whether you’re currently the proud owner of a Pomeranian or are in the process of adopting one, you’re already more than likely in love with this adorable pup’s long, flowing coat. But this type of coat requires frequent grooming to keep it, and your Pomeranian, healthy. Here, we’ll briefly discuss the breed’s coat, and how that determines what is the best dog brush for Pomeranians. If you want to learn even more about the Pomeranian, check out this article. The Pomeranian is a small, toy breed dog with a big personality. Energetic and affectionate, Pomeranians are likely to win over their human counterparts for a wealth of reasons. Of course, the Pomeranian coat is a key part of their appeal. Their furry double coat requires a lot of attention, as there is a plush undercoat beneath a full layer of long fur. The undercoat contributes to the extravagantly fluffy Pomeranian look, while the overcoat provides long, straight fur. This lovely coat does need a high level of care to keep it in the best shape. Now, let’s get more specific about the best brush for Pomeranians. For properly brushing your Pomeranian’s coat, there are several different types of product to look into. Each brush plays a crucial role in keeping your Pomeranian’s coat clean and healthy. The three main tools you’ll want to pick up are a pin brush, a slicker brush, and a comb. The pin and slicker brush can get through the thick coat to the skin beneath. It’s safe to say that a pin brush and slicker brush are necessary staples for keeping your Pomeranian’s coat in tip-top shape. The third key for brushing your Pomeranian’s coat is a comb. Both the wide-toothed and fine-toothed varieties are recommended. Fortunately, there are great combs available that combine the wide-toothed and fine-toothed feature, which we will see soon enough. For now, let’s get started with our Pomeranian brush suggestions! This brush, used for dog breeds with longer coats, typically features wire pins with rubber or plastic tips. Think of this brush as your first go-to in the general brushing process for your Pomeranian. The Chris Christensen Oval Pin Brush has stainless steel pins with smooth, polished tips to balance effective and thorough brushing with a safe and comfortable feel. The brush is designed to move easily through your dog’s coat. It’s also easy for you to handle, with its lightweight design and easy to grip handle. The K9KONNECTION Dog Brushes for Shedding is actually a 2-in-1 brush. While this product is all-purpose for varying dog coats, it is particularly effective for longer haired dogs, working to effectively brush through your dog’s undercoat. You’ll find this standard pin brush on one side with safe, rounded tips. The other side of this brush serves a quite different (but still helpful) purpose. A rubber side is meant to remove loose fur from your precious dog to prevent it from collecting around the house, in the car, and more. The brush uses an anti-slip, gel-infused handle for your comfort. The Hertzko Pin Brush boasts a design that is comfortable to use, for both you and your Pomeranian. The pins on this brush have rounded ends and a design that both “grooms and massages” your Pomeranian. In addition, the brush has a comfort-grip and anti-slip handle to help you feel and stay comfortable with all the brushing ahead of you. The slicker brush is generally your next step in the Pomeranian brushing process. This brush is used with a variety of different dog coats, typically features thin wire or stainless steel pins. It is helpful for both removing tangles and loosening fur in your pup’s coat. With soft and flexible bristles, the Pro Quality Self Cleaning Slicker Brush for Dogs and Cats is great for pets with sensitive skin. This slicker brush can be used for long and short coats, and comes in two sizes, with an option for small to medium-sized dogs that would be perfect for your Pomeranian. The brush removes mats, tangles, dirt, and loose fur. This brush has its own unique cleaning feature, a button and allows you to remove built-up fur by simply wiping it away from the brush head. The Hertzko Self Cleaning Slicker Brush is gentle and effective, getting rid of loose hair, tangles, knots, dander and dirt in your dog’s coat. The brush has fine bent wire bristles to work through the dog’s undercoat while being gentle on the skin. The brush has a comfortable handle to grip, and a special feature that makes cleaning easy. The brush comes with a button to retract the bristles, to help you easily remove any hair. Featuring stainless steel pins, the HappyDogz Pro Slicker Brush is gentle on your dog while also being firm to effectively remove tangles, mats, and dead hair. Advertised as being for a range of dog and cat coats, this slicker brush is strong enough to work through thick double coats. It is also a good option for dogs with sensitive skin, such as Pomeranians. The brush comes in two different sizes, but the smaller option is best for your Pomeranian. Combing your Pomeranian’s coat after brushing is highly recommended. Most Pomeranian owners prefer to use two types of comb: a wide-toothed comb first, then a fine-toothed comb. To tackle different mat types. The Andis Pet 7-1/2-Inch Steel Comb is another great 2-in-1 deal, with one end featuring fine teeth and another with a wide-toothed end. Marketed as being useful for dogs and cats in a range of sizes, this comb works as another step for removing mats, loose hair, dirt and tangles from your dog’s coat. The comb also has an ideal final-stop for brushing through your dog’s coat. Plus the comb is lightweight, making it easy to use. The Pettom Pet Stainless Steel Grooming Dog Comb Tool is another comb that has a fine-toothed and wide-toothed dual design. It features a stainless steel construction with circular, smooth needles to ensure a gentle comb-through. The comb is a safe bet for all sized dogs and works to remove mats, loose hair, tangles, and dirt. Also, the comb is lightweight, making it easier to use. Yet another great option, the JW Pet Company 8-Inch Gripsoft Rotating Comfort Comb is a two-sided comb that uses rounded stainless steel teeth that rotate to move through coat tangles. This comb features a unique rubber, non-slip grip handle for your comfort. It can be particularly helpful when wrapping up a good grooming session with your Pomeranian. Now that we’ve determined our top picks for the best dog brush for Pomeranians, let’s check out some Pomeranian brushing tips. Here we’ll provide some basic tips to give you a sense of the process. Make sure that you brush all the way through to the skin, but stay gentle. Begin with the neck, then move down the back around the sides and to those tough to reach areas around the legs and tail. Work section by section, and keep sessions short but regular. Make sure that you have lots of treats handy, and stay calm and positive. While brushing your Pomeranian can be an enjoyable, bonding experience for both dog and human, it takes work to reach that point. But if you carry on slowly and carefully, you will get there. Coat health is another important factor when it comes to grooming. Hair problems have been linked to diet in some cases. Take special care in feeding your Pomeranian pup! On the flip side, paying attention to how your Pomeranian’s coat looks is important to monitor their overall health. Finally, remember that a coat that is not groomed properly can become painful for your pup. 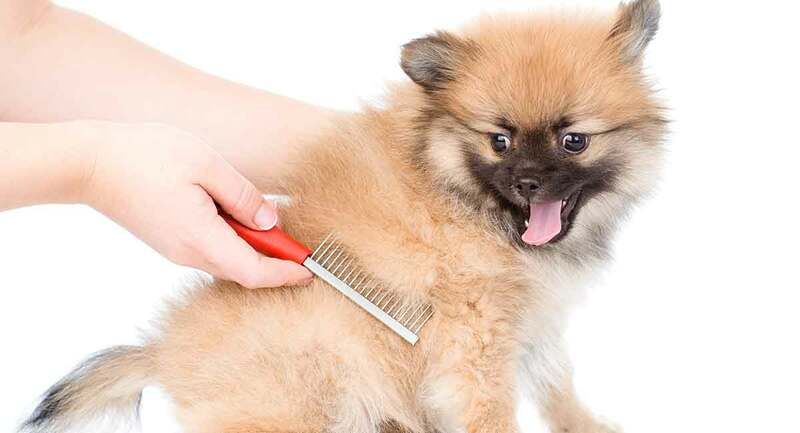 Brushing your Pomeranian’s coat really is a form of TLC that they will surely appreciate. With proper attention to these considerations, combined with using the right Pomeranian brush products, your Pomeranian is sure to grow and keep a stunningly beautiful coat! What is the Best Brush for Pomeranian? We hope this article has provided you with helpful Pomeranian brush recommendations as well as some useful Pomeranian brushing tips. These best brush for Pomeranian suggestions should be able to put you on the right track to ensuring your Pomeranian’s coat will always live up to its fantastic potential! We’d love to know which one of our suggestions you’ve decided to try out. Or maybe you already have the perfect brush for your pup. Let us know in the comments below. Vanderlip S. 2007. The Pomeranian Handbook. Hauppauge, NY: Barron’s Educational Series, Inc.